Hey, isn’t there some kind of big sporting event tomorrow/today? Seriously, I find that Superbowl time is a good opportunity to go out, since there aren’t any crowds. This year, though, I’m working at the time. I wonder if the store will be totally dead. Anyway, I thought I should make at least one concession to the world of athletics here at VoVatia, so make way for the god of games. Sports having religious significance wasn’t all that uncommon in what might loosely be termed the olden days. Just look at the Olympics, for instance. In this case, however, we’re sticking to good old America, and the Aztecs. 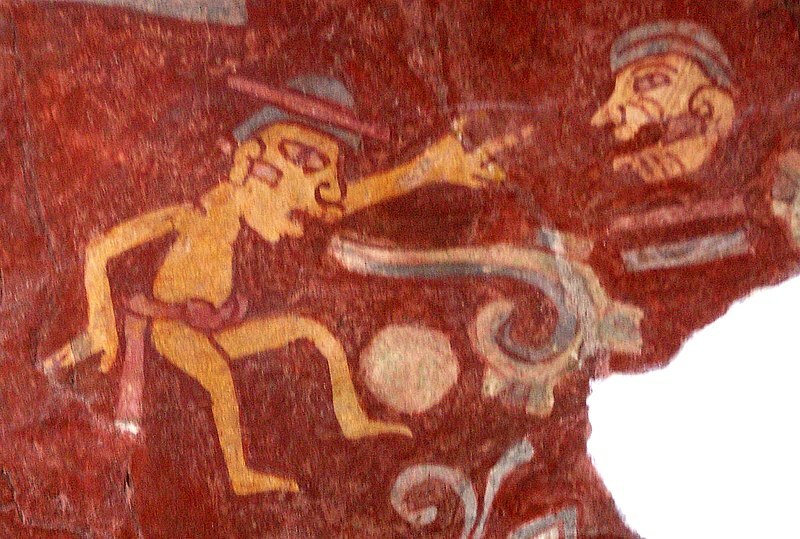 The main sport known to be played by the Aztecs was called ullamaliztli, and would involve the opposing teams trying to get a nine-pound rubber ball into a stone hoop. When you put aside the particulars, it’s a really basic sporting concept. And the Aztecs took it almost as seriously as Americans take football today, ascribing political and religious significance to it. According to the description here, it could be used to settle disputes between leaders, and the court was a reflection of the path of the sun through the underworld every night. There’s also a mention that, at one point during this sport’s lifetime, the losers were sacrificed. Or maybe it was the winners who were sacrificed, because what god would want someone who couldn’t even win at ullamaliztli? As disturbing as human sacrifice is, I’m not totally sure we’ve progressed much over time. At least the sacrifices were likely to be done in an orderly fashion, which is hardly the case with post-sport riots in the modern world. Was there a particular god associated with these games? Why, yes! 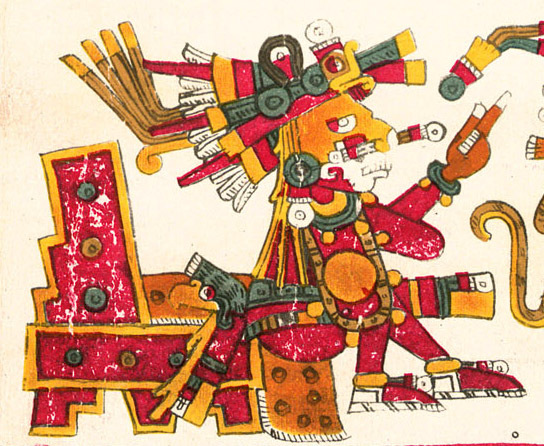 According to the Codex Magliabechiano, a sixteenth-century document discussing religious matters, the deity of patolli was named Macuilxochitl, literally meaning “five flower.” I haven’t seen a mention of his being specifically associated with ullamaliztli, but it seems likely. Macuilxochitl, in turn, was generally regarded as a manifestation of Xochipilli, who was also the patron deity of art, song, dance, love, flowers, homosexuality, and prostitution. You know, all the fun stuff. That said, however, he also gave hemorrhoids and venereal diseases to people breaking ritual law, and demanded the sacrifice of someone dressed up as him at his annual festival. The Aztec gods just couldn’t get enough of that stuff. He also is said to have carried around a pointy stick that he uses to pierce human hearts, but it’s apparently more along the lines of Cupid’s arrows than a shishkebab. That said, maybe this will inspire a new Superbowl snack. 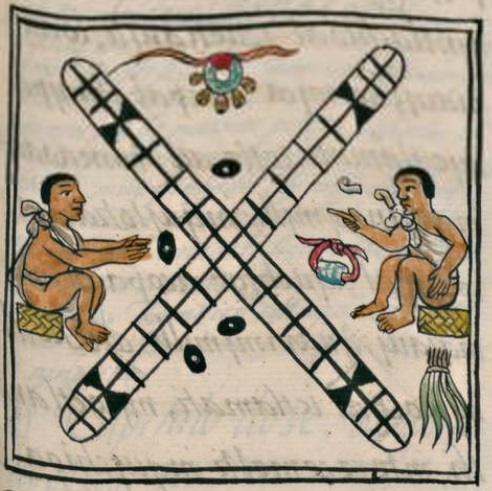 This entry was posted in Aztec, Board Games, Colonization of America, Games, History, Mesoamerica, Mythology, Native American, Sports and tagged american football, codex magliabechiano, human sacrifice, macuilxochitl, patolli, ullamaliztli, xochipilli. Bookmark the permalink. This is SOOOO cool! I just love the title!!!! !